I'm staying at Nizamuddin for two days, so naturally I braved the flies and dirt of the road leading to the dargah, and lunched at Karim's. The meal was fine, the seekh kababs succulent and flavourful, but I was reminded of the hype about the restaurant by articles quoted on the menu's front page. It is strange so many people believe Karim's offers some kind of authentic Mughlai cuisine. To begin with, what we call Mughlai is very distant from what the Mughals ate. Aside from this fact, which applies to all Indian restaurants claiming to serve Mughal dishes, Karim's stands out as particularly inauthentic because all the food coming out of its kitchens is cooked in a partially hydrogented vegetable oil known as vanaspati. It's a cheap ghee substitute originally marketed by Unilever, and based on a chemical process that's been used in industrial-scale manufacturing for exactly a century (Procter & Gamble began making Crisco in 1911). There were no Mughals left in 1911, but had there been any, I can guarantee they'd have turned up their noses at the idea of kababs and biryani cooked in vanaspati. Jabeen and I did exactly that when we first dined at the Karim's in Old Delhi over a decade ago, and I'm sure the Mughals had more discerning palates where this kind of food is concerned. 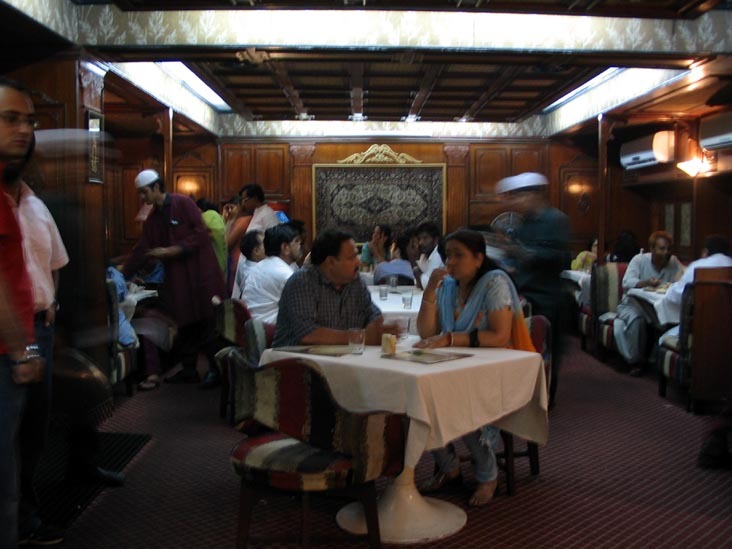 Karim's has gone posh in the past couple of years; the Nizamuddin branch is now a spacious, two-level affair with air-con. The owners clearly have no need to use vanaspati as a cost-saver any longer, but they've stuck with it. They believe, I suppose, that their regulars have acquired a taste for the inferior, trans fat laden cooking medium they have used for decades. Unlike the Mughlai tradition, the nawabi one that flourishes in Lucknow has genuine claims to authenticity: a number of current chefs are descended from men who cooked for Wajid Ali Shah and his extended family. One such chef has opened a chain of biryani and kabab eateries called Kakori House. The three Kakori House outlets in Bombay have a few tables for in-restaurant dining, but operate mainly through delivery and take-away. They provide by far the best home delivered kababs I have had in my life. The first time I ordered from Kakori House I wasn't fully satisfied. We asked for haleem and galouti kababs, and didn't care for the consistency of either. It's one thing for kababs to melt in the mouth, quite another for them to be melted before they get to the mouth. I like meat to be at least a bit aldente since, unlike the nawab for whom the galouti kabab was supposedly invented, my teeth are virtually intact. Kakori House's burra kababs, which I was treated to by my friend Jerry and subsequently ordered from home, provide exactly the right combination of resistance and softness. Their smoky flavour is exceptional, way better than most high-end Indian restaurants can manage; and the biryani is brilliant as well: flavourful but not over-spicy, and loaded with juicy goat meat. Kakori House is a premium caterer: most dishes cost between 150 and 300 rupees. But for those who are sick of run-of-the-mill Mughlai offerings, and are willing to pay extra for real quality, I whole-heartedly recommend this relatively new chain, particularly the mutton biryani and burra kababs. Ok, now could we have the number of Kakori House? And does Meals on Wheels have them in their roster? I visited Karim's (the mothership near Jama Masjid) in Feb. Everything but the seekh was bloody awful. The best kabab I've had in Delhi was years ago at a Tunday kababi stall at Pragati Maidan. I don't know if it's still there. You might have had of Tunday - it's a branch of the famous Lucknow kabab shop. There are several fake Tundays - it has become a generic name, like Hot Chips. I think, but I'm not certain, that the one I ate at was the real deal. Whatever the case, the galaoti kababs were outstanding. Thanks for the inputs, Srikanth, Pronoti. Will try and get to the Pragati Maidan Tunday kabab walla, hopefully the right one. DS, don't have the Kakori number on me, will give when I'm back, though it should be on the Net somewhere. The closest branch to you is the Mahim one on L J Road. The tunday kababi place in Daryaganj is fantastic. Not just the tunday kababs, which are faultless (what would I know about faults in kababs anyway - I'm from Chennai), but also the roast chicken, which comes swimming in marinade. It's messy, rich and totally brilliant. I had Karim's kabab's a few years ago and found them ok. I was a bit surprised because they are written up so much!